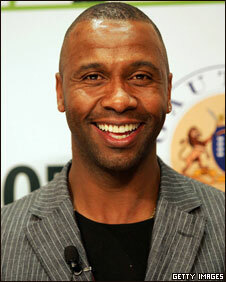 Former South Africa captain Lucas Radebe is recuperating after undergoing a medical procedure for a heart complaint. The former Leeds United and Bafana Bafana player was taken to hospital last week after collapsing at the gym. He had the procedure on Friday and was released from hospital on Monday. The 2010 World Cup ambassador was allowed to return home and his agent Glyn Binkin told the BBC that he expects to make a full recovery. "He feels pretty upbeat," Binkin said. "It's just another hurdle in his life. He's had to overcome many obstacles over the years and this year in particular has been very trying." Radebe's wife, Feziwe, died in October after a long battle with cancer. "It's now a case of Lucas putting Lucas first and making sure that he's able to be the best possible person, first and foremost for his family and then for everybody else," Binkin said. "The World Cup is obviously a very important milestone in Lucas' life and in the history of South African football and he certainly wants to be a part of that." Binkin also said Radebe hopes to return to his former English club one day. "He's got huge ambitions beyond the World Cup as well and still harbours the possibility of returning to Leeds some day, post 2010."